Friday 9/7/2007 ~ The "Old-Guys-Rock Show"
So, after three hours of putting up drywall (helping someone build a studio), I sat down in front of the TV to rest. The MOJO-HD channel just happened to be on, and much to my surprise, I stumbled upon the "Old-Guys-Rock Show." That wasn't the real name of the program... but it was guys from my childhood who now look like grandfathers. (And probably are grandfathers...) I watched with mixed emotions: On one hand (the wrinkled one), my childhood was obviously a long, long time ago. On the other hand, the songs have held up well. The musicians may be old, but the music still rocks. ** The first performance was The Who from The Isle Of Wight in 2004. Well, half of The Who. Since 50% of the original band is dead, it was Roger Daltrey and Pete Townshend with two new guys. The fabulous drummer was Ringo's kid, Zak Starkey. (He visited Pittsburgh Guitars a few years ago and was a really nice guy.) I don't know who the bass player was, but much like the original bassist John Entwistle, he was fairly motionless. I thought that Pete Townshend once announced that he was going to play all-acoustic due to hearing issues. But he was doing his trademark windmills on a modern day red Strat. ** Next on the show were The Rolling Stones. It was a relatively new video shot in a small club. They were lip-syncing to an recent, uneventful mid-tempo song, so I didn't pay much attention. I used that chance to get up and pour myself a drink. I did notice, however, that Keith Richards was using his rare black ES-355. (You can tell it's a 355 by the bound headstock.) (If you recall, the ES-335, ES-345 and ES-355 all share the same body, but the 355 is the fanciest, with white binding on the headstock.) (Which is also how you can recognize a Les Paul Custom and an SG Custom.) (So from a consistency standpoint, Keith's guitar should really be called an ES-335 Custom...) (But it's not.) Ronnie Wood was using his mid-1950s maple-neck sunburst Strat. This 2005 reunion concert was quite impressive. Jack Bruce, on bass and vocals, could still wail. And on guitar Eric Clapton was Eric Clapton. Like Pete Townshend, Eric was also using a Stratocaster. Unlike Pete, who was using the bridge pickup for maximum brightness, Eric had his pickup selector switch set for the neck position. That was nice to see... and hear. Eric started this approach to pickup settings back in the 1960s when he was using a Gibson Les Paul through a Marshall amp. He found that if you used the guitar's neck pickup, with it's tone control turned all the way down (resulting in the mellowest possible sound from the guitar)... and ran this through a tube amp turned all the way up... the bite from the cranked-up amp, combined with the mellow signal from the guitar, would result in a rich, beautiful tone. A tone that lent itself to sustain. And no one could use this tone better than Eric. In fact, it even has a name: "woman tone." Eric may have coined the term himself, but it's now part of the guitar aficionado lexicon. You know, speaking of Strats, every Christmas Fender sells a beginner set called a Strat-Pak. It's a Squier Strat, an amp, a gig bag, a tuner and a bunch of other stuff, all in one box. A few days ago I noticed that we are using two of these Strat-Paks as a mini-wall in front of our cash register. If you recall, we moved to our new location last December 1st, at the start of the Christmas season, and we set things up here in a hurry. We were open until 8PM up the street at 1409 East Carson one day, and by the next morning at 11AM we were open for business at 1305 East Carson. (That was one busy evening!) When we were arranging the new place we needed something to put in front of the cash register, and these two boxes fit, so I put them there. From that point forward they were so close that we stopped seeing them... Until this week, when I said, "What the???" Here's John, not noticing a Strat-Pak. PS: The song I saw The Who performing on TV this week was "My Generation." Coincidentally, as I'm typing this I can hear our guitar instructor, John Purse, teaching it to one of his students! That's weird. PPS: Speaking of "Sunshine Of Your Love," I've always been amused that Eric Clapton starts the solo by playing the melody of "Blue Moon" by The Marcels. PPPS: A few years ago we featured John Entwistle in our annual Halloween Show, "Night Of The Singing Dead." We put together a late-great super-group, and we used a mannequin for Entwistle. Yesterday, though, the travelers showed up with a Guild Starfire with a broken headstock. As you may know (but hopefully don't) broken headstocks can't be done quickly. After the repair is properly completed everything has to be clamped together and the glue needs time to dry. Unfortunately, these guys had to be on the road immediately after their gig. So they said, "We need the expertise of your repairman (world renowned luthier Scott R. Johnson) to re-set the cracked headstock... But we have a guitar tech who, in a couple of days, can unclamp it, re-install the machine heads and set it up. What if we bought the C-clamps and took it with us in clamped-mode?" I said, "Sure! Why not!" Over the years the most common broken headstocks we've seen have been on Les Pauls. Although from a percentage standpoint... i.e. number of a certain model vs. number of broken versions of said model... the winner would have to be the 1963-1965 Gibson Reverse Firebird. With its heavy banjo-style tuners, pointing backwards instead of out to the side, and with a poorly designed case that allows the headstock to rest on the tuners in the case, the Reverse Firebird is a break waiting to happen. In fact, if you see someone with a Reverse Firebird, the first thing you should say is, "Hey, nice guitar!" Your next comment could safely be, "How's the headstock repair?" Scott says he broke his first headstock years ago when he had his Les Paul and Strat plugged into the same A/B box onstage. When he walked across the stage with the Strat he accidentally dragged the A/B box, which in turn pulled the cable still plugged into the Les Paul. The Les Paul fell off it's stand... and a guitar repairman was born! A Rickenbacker of mine broke when we were jamming in the basement and a jammee got the cable wrapped around his leg... As he walked away, he pulled the Rick off of the amp it was precariously leaning on. PPPS: The band with the broken Guild Starfire was called Feist, and the leader, Leslie Feist was very nice and friendly. She bought a Gretsch Anniversary here to replace the Starfire while it's healing. Here's a picture of her with the Guild. ABBA, IKEA, Yngwie Malmsteem... Hey, who doesn't like the Swedes? But long before you could buy a Fjorvid shelving unit for $99, another Swedish company had success here in the good ol' USA. When I was young, every kid on the block had an electric guitar, and I remember all of them. My brother John had a Gibson SG, Tom had a Gibson ES-335, Jim had a Gibson Melody Maker, Chuck had a Kent, Danny had a Baldwin Vibraslim (Baldwin's version of a 335), and two guys, Denny and Dale both had Swedish Hagstrom guitars. The Hagstroms were intriguing. Unlike other guitars, the Hagstroms had a vinyl back which folded over the edges and the entire front was molded plastic, held on with large screws. And if that wasn't weird enough, between the pickups was a small grill that, at first glance, looked like a speaker! At the time I couldn't decide if they were cool or cheezy. Now, in retrospect, I realize they were both! The Hagstrom company was founded in Sweden in 1925 by Albin Hagstrom, to manufacture and distribute accordions. Things picked up after World War II as the accordion market grew rapidly. Hagstrom opened numerous retail stores in Sweden, and sought to expand their market to America. Luckily, in the mid-1950s, the TV success of Lawrence Welk created a demand for accordions, and Hagstrom was able to establish extensive U.S. distribution. Along the way their product line grew to include horns, violins, drums and... our favorite: guitars! With their U.S. distribution network in place, they were in the right place at the right time to capitalize on the surprise every-baby-boomer-wants-a-guitar Beatle-impact of 1964. When my childhood friends were shopping for guitars, Hagstrom's most popular model was the PB-24-G, or simply the "Hagstrom I." I thought of my early rock & roll days and those early guitars this week when John pointed out a recent photo of Neil Young recording with a Hagstrom I. Here's the picture. Here's a better shot of the same model from the Pittsburgh Guitars collection. And, yes, they made a bass version too, the PB-24-BG. And here's a close-up of the wacky grill between the pickups (it's just stick-on material). As you may be able to see from the picture, the entire front of the Hagstrom I was one piece of plastic. It was raised and painted white in the "pickguard" area and the rest matched the color of the vinyl on the back. There were several color choices: red, blue, white and black. Over the years we've seen an even representation of each color. In the mid-1960s, in an attempt to keep up with the extreme demand, guitar manufacturers were making guitars as fast as they could make them. I don't know if the vinyl/plastic approach was too labor intensive... or if its unique look was a bit TOO unique and Hagstrom wanted to become more mainstream... but it wasn't long before they dropped the idea. By late 1966 they had moved on to a more typical all-wood body. The two pickup version was called the Hagstrom II and the three pickup was called a Hagstrom III. Here's a picture of a 1966 Hagstrom III, still with the single coil pick-ups, but now an all-wood body. By the early 1970s, Hagstrom tried to become as "normal" as possible, with humbucking pickups and standard Gibson-style wiring. Shortly after that, they took "normalization" one step further with the Les Paul shaped Hagstrom Swede. The company concentrated on that model through the 1970s, until 1983 when they closed up shop. The Hagstrom Swede. Although the wooden body Hagstrom IIs and IIIs and the Les Paul-ish Hagstrom Swedes are fine guitars, to me the glory days of Hagstrom will always be the 1965-1966 Hagstrom I period. The 1960s were an exciting innovative time. Electric guitar sales were skyrocketing, and fashion and design were constantly changing. The Hagstrom I, with its plastic and vinyl look, is an excellent representation of that era. It may have seemed out of step and dated by 1968, but today it's "dated" in a good way... it harkens back to an innocent time... socially, politically, and guitar manufacturingly. PS: In 1963 Guild decided to get into the solid-body electric guitar field, and they needed a vibrato system and an adjustable bridge. As I mentioned earlier, Hagstrom had numerous retail shops in Sweden, and one of the American brands that they imported were Guild guitars. This relationship led to Guild buying vibratos, bridges and even pickups from Hagstrom. Here's a 1963 Guild Thunderbird with a Hagstrom bridge and vibrato. You can see that it's the same as the one on the Hagstrom III. PPPS: I don't own a Hagstrom Swede, so I looked through our collection of old catalogs to find the picture we used above. In the Hagstrom folder I found two pages from the 1965-1966 US distributor... one with the Hagstrom I instruments and another with the newer Hagstrom IIs and IIIs. I thought it was so cute to see a big "X" drawn through the Hagstrom Is with the word "Out" written, that I scanned them to show you. Right on these two pages we can see time marching forward! PPPPS: I didn't mention it earlier, since this email is so long already, but the US distributor thought the Hagstrom model designation was too long, so he renamed the PB-24-G Hagstrom I as the "F-11." The PB-24-BG was renamed the "FB." Likewise, the Hagstrom II, the Hagstrom III and the Hagstrom IIB Bass were renamed F-200, F-300 and F-400 respectively, for USA sales. PPPPPS: Ok, that ought to be enough about Swedish guitars for now! Let's move on to Swedish movie stars! PPPPPPS: Thanks to everyone who responded to last week's "broken headstock" email, with stories about their guitars. My favorite headstock story came from Hank L. I'll tell you about it next week. Re: The email from two weeks ago - Broken Headstocks! 1) Lots of folks sent in stories about their broken headstocks... with a variety of different makes and models. (Everything but a Fender!) My favorite story came from Hank. Years ago Hank was doing a gig at that famous Pittsburgh punk landmark, The Electric Banana. (If a gun is drawn, it's probably by the owner!) The ceiling at The Banana wasn't very high. You could practically reach up and touch it. In fact many people did; it was covered with band posters. And if you were on the semi-stable stage, well, headroom was at a minimum. During one song Hank made a particularly dramatic move with his Gibson ES-330, and the headstock of the guitar went right through the ceiling! Surprisingly, the guitar was not damaged. But as he struggled to pull his guitar out of the ceiling, the stage started to wobble. The next thing he saw was his Vox Phantom 12-string, previously right behind him in its guitar stand, falling off the side of the stage. The headstock split vertically, right through the machine heads. Fortunately, he found all of the parts and once it was repaired, it worked perfectly. Actually, that was the concluding comment by everyone who responded on this topic. Although they were initially heartbroken, once a professional repair was completed, they loved their guitars just as much as before. 2) One of my cherished possessions also had a broken headstock at one time. It's the 1972 Les Paul that Dave Hanner used in the band Gravel. Here it is from the front. Here's a shot of the repaired headstock (fixed circa 1974). 3) Many famous guitars have repaired headstocks. Here are some examples: the 1959 Les Paul used by Duane Allman in the Allman Brothers; the 1957 Les Paul used by Dickie Betts in the Allman Brothers; the 1959 Les Paul used by Garry Rossington in Lynyrd Skynyrd; the 1958 Les Paul used by Jimmy Page in Led Zeppelin; the early-1960s SG used by Duane Allman in the Allman Brothers; the 1959 Les Paul used by Peter Green in Fleetwood Mac; and the 1964 Rickenbacker 325 used by John Lennon in The Beatles. 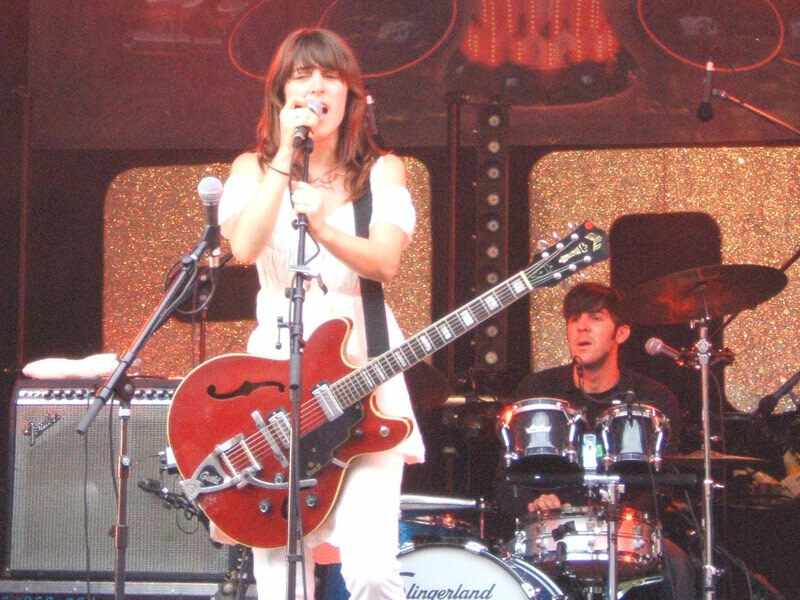 4) The broken guitar that inspired the original email thread was owned by Leslie Feist of the band, Feist. I first heard of her two weeks ago when she visited our store and we repaired her broken Guild Starfire. Much to my surprise, while watching the Steelers game two days later, I saw her about a hundred times on her iPod commercial. "1, 2, 3 ,4.." It's a very cute song. 6) Several people wrote about the Hagstrom Swede with the synthesizer add-on. Tim wrote to say that his band, Trinity, won one in a contest... and he thinks they still have it somewhere. He's going to look around. Meanwhile, Mark G. wrote to tell me about the bass version he has. Here's a picture of his Hagstrom Swede bass and the companion Ampeg Patch 2000 Synthesizer Unit. 7) Connecting two weeks ago with last week was a "repaired headstock" story from Larry L. He has a Guild Jet Star Bass that he bought at Pittsburgh Guitars in 1979. It's just like the one used by Peter Tork in this picture. As I mentioned last week, Hagstrom sold parts to Guild for their electric guitars. The bridge and pickup on Larry's bass, as well as on Peter Tork's, were made by Hagstrom. The pickups and bridges on these basses were also made by Hagstrom. 8) Last week I asked Scott if he remembered also seeing Hagstrom parts on any other brands. He said "Yeah, in the early 1970s Harmony sometimes used Hagstrom bridges on the H-72 model." I said, "Really??" Then yesterday a kid comes in for a repair and he has with him: an early 1970's Harmony H-72 with a Hagstrom bridge!! Here's a picture. What are the odds of that?